The Mac community is waiting with bated breath for this week’s expected Apple tablet announcement, but according to some quantum theorists, Mac communities in nearby parallel universes have been playing with Apple tablets since the Reagan administration. 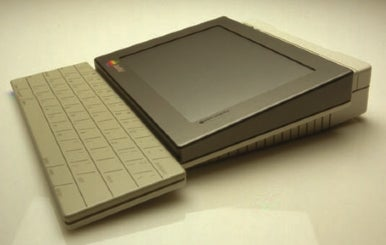 This past week, Frog Design released pictures of the “Bashful” tablet, which was on the drawing boards in 1983, but never made it to the shipping stage. 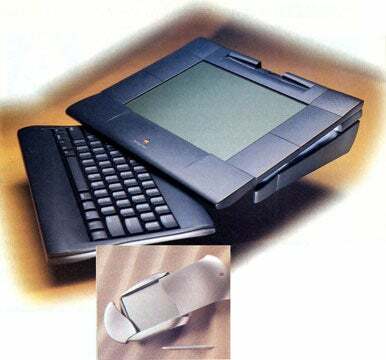 The Bashful looks like the top half of a PowerBook Duo combined with a keyboard stolen from an Apple IIc; a stylus rounded out the Bashful’s user interface. Some explanation of why this is mind-bending may be useful for those of you who don’t remember the 1980s. (And there were many good reasons to forget that decade; we actually believed terrycloth and polyester were suitable materials for clothing.) In 1983, the Apple Lisa cost nearly $10,000 (somewhere between $20,000 and $40,000 in today’s dollars), and the Macintosh and Apple IIgs were still in the future. The Apple user experience was defined by what we had on the Apple II+ and Apple IIe, where “80 column cards” were an advanced technology which bumped high-resolution graphics from 280 by 192 pixels to 560 by 192 pixels. Folder icons and mice were advanced Lisa ideas; Apple II users lived a largely text-based existence until they launched an application. AppleWorks, an insanely popular office suite for the Apple II series (before we called such software “office suites”), drew folders and tabs onscreen with text graphics, and we all thought this was really nifty. Unless Apple had a third operating system up its sleeve in the early 1980s, the Apple II interface is what you would have had on the Bashful tablet. It would have been nothing like any tablet device marketed since. Unfortunately, we’ll never know how the Bashful would have done on the market; Steve Jobs was more interested in another computer called the “Macintosh” at the time, and relations between Apple and Frog Design broke down when Jobs left Apple in 1985. But next time I’m quantum leaping to alternate Earths, I’ve got to check out a Bashful. Even by 2010 standards, I’m sure whatever Beagle Bros. released for it was wicked cool.